In a study performed within the BMBF-funded MiKlip project ALARM Dr Matthew Toohey from GEOMAR Helmholtz Centre for Ocean Research in Kiel, Dr Hauke Schmidt and Dr Claudia Timmreck from the Max Planck Institute for Meteorology in Hamburg, and Prof Kirstin Krüger from the University of Oslo have investigated together with ice core and tree ring experts from Switzerland, the UK and the USA how explosive extratropical eruptions impact the surface climate in the Northern Hemisphere. The results were recently published in Nature Geoscience. 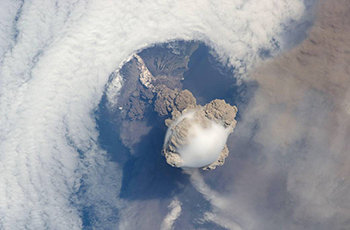 Extratropical volcanic eruptions were commonly thought to be less effective at driving large-scale surface cooling than tropical eruptions, because of a reduced atmospheric life time of the emitted sulfur. To quantify the climate impact of extratropical vs. tropical eruptions in relation to their sulfur emission, the authors compared in their study new ice core-derived volcanic sulfur injection estimates with three Northern Hemisphere summer temperature reconstructions from tree rings for the last millennium. They found that extratropical explosive eruptions produce much stronger hemispheric cooling than previously thought. The authors explain this result with the help of stratospheric aerosol simulations for Pinatubo-like eruptions at different Northern Hemisphere latitudes. The simulations show that the lifetime of the volcanic aerosol from such extratropical explosive eruptions is only marginally smaller than for tropical ones and the aerosol is mostly contained within the hemisphere of eruption rather than globally distributed. Hence, extratropical eruptions produce time-integrated radiative forcing anomalies over the Northern Hemisphere extra-tropics up to 80% greater than tropical eruptions for the same amount of sulfur injected at the same height. Although the relative amount of extratropical large explosive eruptions is small compared to tropical ones, they play an important role for climate. The strongest Northern Hemisphere cooling episode of the past 2500 years resulted from an extratropical eruption in 536 CE and marked the start of the Little Antique Ice Age. The results of this study will not only help to better understand and interpret past climate changes but also to better predict which climate changes are to be expected when the next large extratropical eruption happened.